Is it time to burn down the mission? ATTENTION, class--it's that time again. Time to visit the year 1769, when a great number of stunned, baffled, and recently Christianized Indian laborers--beneath the gaze of Father Junipero Serra and under the guns of Spanish soldiers--began construction on a giant wood-and-clay structure. Mission San Diego de Alcala--part church, part farm, and part military installation--was the first of 21 such installations in the region that came to be called California. We jump ahead 53 years to behold a mighty chain of such missions, stretching all the way to Mission San Francisco de Solano in Sonoma. Catholic missionaries, bless them, introduced not only Christianity to the Indians, but smallpox, pneumonia, and venereal disease as well. By 1850, the native population was reduced from 30,000 people to a mere 3,000; and the missions--now a potent symbol of cultural contact gone bad--were abandoned by the padres to lie in ruin. But that's not the end of the mission story. Almost 13 decades later, the building begins again, at a rate never dreamed of by Father Serra. To date, literally millions of the baffling edifices--hundreds of thousands per year--have been obediently built, abandoned, and forgotten as part of a massive state-funded program. Last year alone, an estimated quarter of a million native Californians were forced to build missions with only the faintest glimmer as to why. Most adults who received their education in the public schools of California can recall their fourth-grade mission-model project. From Redding to Chula Vista, the annual building of mission models is as much a part of going to school in this state as are smog alerts and armed-gunman drills. But how did this tradition begin? The California public school curriculum--which has ordained fourth grade as the school year that students learn the history of the state--says only, "Teachers should emphasize the daily lives of the people who occupied the ranchos, missions, presidios, haciendas, and pueblos. Reading literature, making trips to a mission, singing songs . . . will bring this period alive." Models are not required. But as Diane Silveira, a Sonoma County elementary-school teacher for over 30 years, puts it, "History can be boring. The models are an attempt to make history come alive." "The mission story is an important part of the big picture of California," explains retired educator Dorothy Brenner, who personally oversaw the making of hundreds of such models during her 36-year teaching career in Sonoma County. "There is a major transition during that period, during which the Indian culture is completely destroyed. That's a big thing for kids to learn. When I was first teaching fourth grade, building the models had a place. By building a model the students could get a sense of what it might have been like to live there." But times have changed. 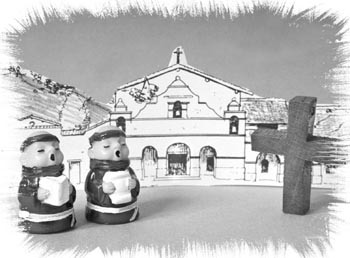 Not only are we more willing to look at the atrocities enacted by those Spanish missionaries, but teachers have learned that different children acquire knowledge in different ways; while a model-building assignment might be fine for Jimmy, the hands-on learner, it could be devastating for Jane, the auditory learner. "Honestly," says Brenner, "I'm not sure what place the models have in the classroom today--though 20 years ago, I can say that many kids really did look forward to building a mission." OF COURSE, that was a time when the models were made of simple household items: shoeboxes, corrugated cardboard with glued-on noodles, sugar cubes, and graham crackers stuck together with marshmallows. Though such low-budget versions still land on the teacher's desk each year, an increasing number of mission models have gone upscale. Made of not-inexpensive foam coreboard, painted with special coatings made to simulate the look of whitewash over adobe, with prefabricated sheets of plastic roofing that resemble the terra-cotta shingles of the missions, these sophisticated models make the simple, quaint, old graham-cracker missions look like underfed distant cousins. Not surprisingly, whole industries have sprung up to support the yearly mission-building tradition. A vast number of cardboard, punch-out-and-assemble pattern books are available, with prices ranging from $5.99 to $25. Canyon Foam Design, in Ontario, Calif., has even trademarked the term "California-Mission Kit" as the name of its prefab Styrofoam missions, available in the exact shapes of all 21 layouts for a tidy $32.99. Create-a-Mission, in Modesto, has come up with an entire line of miniature wagon wheels, mission bells, brooms, saddles, and crucifixes that lend an air of miniature realism to any kid's project--for "only" $1.99 per item. The outlay for such materials can add up pretty quickly. According to Isabel Martinez, who for several years managed a craft and model store in Petaluma, the average do-it-yourself mission model ends up costing around $75. Christine Delgado, general manager of Ben Franklin Crafts store in Novato--which sells a fair amount of mission-model supplies each year--agrees that things seem to be getting out of hand. "Schools don't know how expensive these models can be," she says. "And how much pressure these kids are under to build an impressive model. I helped one kid who was wandering the aisles, almost in tears. He said, 'My mom only gave me $10 to build my mission. How can I build a good model for only $10?' " Delgado, sensibly, showed the boy how to make adobe bricks from $5 worth of clay, and encouraged him to use sticks, leaves, and dirt from his backyard to add detail to the model. "It has gotten out of hand," agrees Silveira, who suspects that it's the parents, not the children, who've pushed the model-building project to such architectural extremes. "Most teachers are thrilled to get a cardboard box with holes cut out for windows, as long as the [children] can get up and talk about the model and show that they've learned something about the mission they studied. We'd rather have that than some Taj Mahal that the parent built, because usually the kids haven't learned anything." AT THIS POINT it would appear that the educational value of this ritual of the mission model--assuming it ever was an effective tool for teaching history to children--has diminished so much that it now exists mainly to support the mission-model cottage industries. Some teachers now refuse to assign them, preferring to engage their students with other, less time-consuming methods. Jim Silverman of the California History Project encourages teachers to have students make a quick study of the architectural facts of the missions, then choose a single mission to build as a class. Meanwhile, the classroom is transformed into a politically correct mission environment as the children take on the roles of the Indians, the padres, the soldiers, etc., and act out the culture clash with improvisational theater. Though it is clearly time to rethink the mission-model tradition, it may be too soon to trash the whole idea, along with the countless dumpster-bound models produced each year. Perhaps, by relating the true story--with all of the riveting, complicated, philosophically complex, and undeniably bloody details--the annual building of a little model can indeed become an experience that fourth graders will never forget.